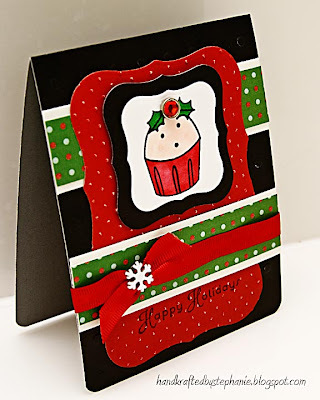 My card for today is for Jen's Sketch for You to Try and for the OCC inspiration challenge (2nd photo). 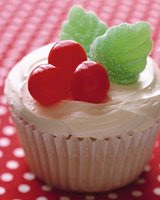 I thought what a better image to use than holly cupcake from Stamp a Sweet Impression. I used the dots from the tablecloth as inspiration as well and decided to make my card bold with a black background. Thanks for looking! Cardstock: CTMH, PTI; Patterned paper: DCWV Christmas stack; Stamps: Stamp a Sweet Impression; Ink: Memento Tuxedo Black; Copic markers; Cuttlebug swiss dots embossing folder; Nestabilities labels one; Other: rhinestone, snowflake brads, ribbon, corner rounder, foam tape. Cute!! This card has ZING! Very yummy, love your bright happy colors.